We are passionate about the safe grinding and removal of stumps on your property. The sight of a stump definitely isn't appealing. 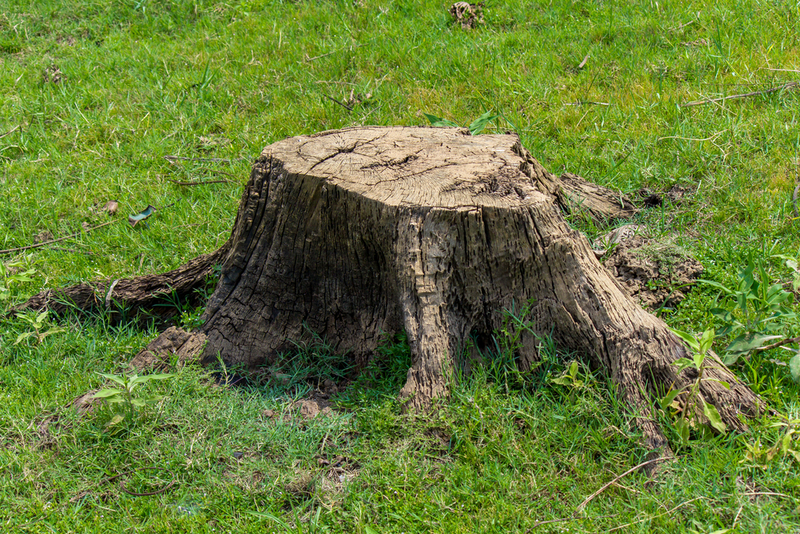 If you're meticulous about your yard and landscaping, removing the stump is a must. Tree stumps can be a hazard in your yard if you have kids playing and can damage lawn mowing equipment. If that isn't enough leaving an old stump can lead to new tree growth. New sprouts can start popping up everywhere. An old decaying stump will attract insects to your yard. When you leave stumps in your lawn, the decaying tree takes a long time to rot away completely. While it's decaying, the stump attracts beetles, termites, ants and other wood-boring pests. You may not mind them in your yard, but they can eventually spread to your home. Upon removal of a tree an owner may choose to have the stump ground away. The process of stump grinding is achieved using a high rpm stump grinding machine which processes your stump into fine wood chips which return to your soil as mulch. Stumps are traditionally ground 8-10” below existing soil grade. Root pruning is often desirable to stop the spread of trouble roots near houses, fences or concrete. How do you remove a stump? We used specialized machinery to grind the stump into wood chips. What do I do with the wood chips? We rake all chips into a pile. Most of the time they will settle to ground level. How deep can you grind the stump? We can grind stumps up to 15 inches deep depending on which one of our machines we use. What about buried utilities and irrigation lines? We take every precaution to avoid cables and irrigation lines but the homeowner is responsible to advise us where the irrigation lines and sprinkler heads are. If we are not comfortable with where the utilities are, we will call to have them located. Sometimes it is not possible to save the irrigation lines and grind the stump too. How small or large of a stump can you grind? We can grind any size stump as long as our machine has access to it. How close to a fence or house can you grind? How much access do you need to get to the stump? We need at least a 3 foot wide access point to get to a stump with our smaller machine. This machine is also small enough and light enough to remove any stumps inside a pool deck. Will the machine hurt my yard or damage sidewalks and driveways? Our machines will not hurt driveways or sidewalks. They are lighter than most vehicles. Only a yard that is very wet from heavy rains will retain a small impression from our machines. Under normal conditions there will be no marks in the yard at all.